As some of you know, I will be competing in my first Ironman this year, heading south to Ironman Chattanooga. I’ve been racing triathlons for just over 2 years now, and will be racing as a professional/elite this year. This sport has given me so much already in only a few years, and I want to give back as much as possible. Right now, I can use triathlon as a platform to help me raise money for a cause that is personal to me and my family. My younger sister, Jill, was diagnosed with Crohn’s / Colitis in 2008. This chronic and serious illness has significant effects on daily life, and is often difficult to talk about with others. She has had to deal with many awful symptoms of the disease over the past several years and tried a number of medications, but has handled it like a champ. She’s even completed a marathon and many half marathons, while battling the disease. Right now, there is no cure for Crohn’s or Colitis. The Crohn’s and Colitis Foundation of America (CCFA) helps fund research efforts, and every donation gets us one step closer to finding relief for the millions of people affected by IBD (inflammatory bowel diseases). You can learn more about the CCFA and donate on my personal fundraising site. The CCFA actually has a team, Team Challenge, that trains and raises money through endurance events. In fact, they have a group training for IM Chattanooga! The currently do not have any spots left on their team for this event, but I’m excited that I will get to meet and race with a group that is supporting this cause. Jill and I after finishing her first half marathon! 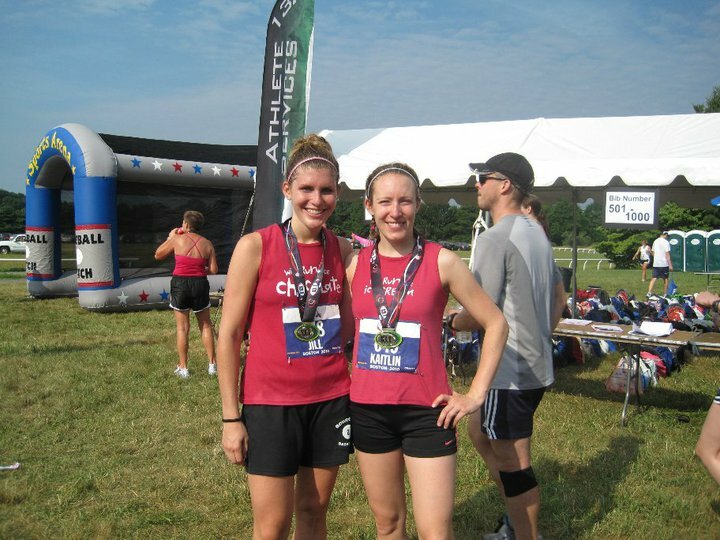 My superstar sister was nice enough to answer a few questions and share her experience living & running with IBD! K: When were you first diagnosed with Colitis? K: How does it affect your daily life? J: Right now, I am symptom free!! (KNOCK ON WOOD). My GI doctor is awesome and has found the perfect mix of medicines (3 different prescriptions & 12 pills a day!) to keep me in remission for now. While this can change at a moment’s notice, I am thankful to be feeling healthy. This is an incredibly frustrating disease because there is no cure. When it is active, I am weak, don’t have much of an appetite and I am in a lot of pain. When it is really flaring, I’ve been put on steroids, like Prednisone, which have some really terrible side affects like restlessness and weight gain. It really is demoralizing. It has taken me a long time to feel comfortable talking about having this disease- in fact, many people don’t even know that I suffer from it- but now I realize how it important it is to talk about if we are ever going to find a cure! K: You’ve been running half marathons and did a full marathon last year. How did you manage your tummy troubles in these long distance races & training? J: I love running, but would definitely consider myself a recreational runner (in comparison to my super triathlete sister)-when I’m not training for a specific race, I probably run about 20-25 miles per week and when I am training, I go anywhere from 25-40 miles. I also like spinning, Insanity and doing some light weight lifting. Everyone is different so finding what your body can and can’t handle before, during and after a run/workout is really important! It takes a lot of experimenting and listening to your body. I have learned what foods work well for me before a race (PB toast with banana on it- yum!) and I know it’s extra important for me to drink a ton of water after running. When I get dehydrated, my tummy tends to feel worse! During a race, I have a hard time with liquid GU, but I can usually handle the gummis…sometimes I’ll even fuel with Swedish Fish! K: Do you think running and being active has helped you overcome some of the symptoms? J: Absolutely!! Knowing that I have a chronic disease, I do EVERYTHING that I can do be healthy in all aspects of my life that I can control. I eat as healthy as I can (well, most of the time 🙂 ), exercise and get a lot of sleep. I think this is good advice for anyone-whether you have a disease like mine or not! I’m a naturally energetic person and I attribute it to taking good care of myself. K: Any tips for people that have Crohns, Colitis, or other GI issues that want to do endurance sports? J: For anyone out there suffering from these diseases or something similar, I think my biggest piece of advice is being in tune with your body. This is something that I have gotten really good at over the past 6 years. Some days you just may not be able to do it- you may run out a mile and have to turn around and call it a day and that is okay! Don’t get discouraged- tomorrow is a new day. Whenever I’m training for a race, I remind myself that missing one run isn’t the end of the world. Thank you for joining me in helping find a cure for IBD! Any little bit helps, and I hope you will help me in supporting this great cause. ← It’s supposed to be hard.